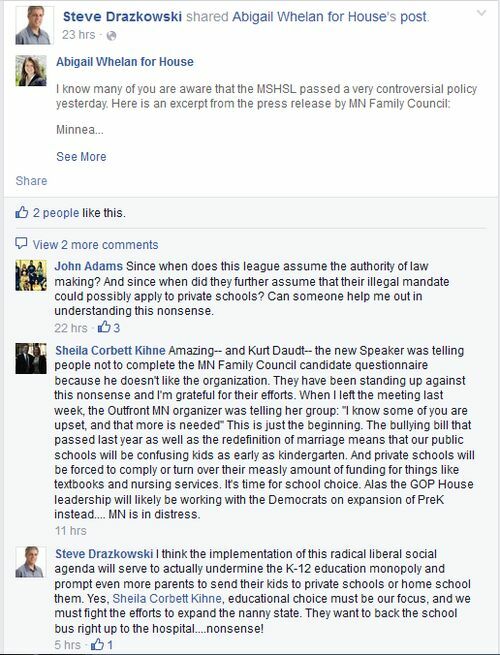 Bluestem already looked at some of the deep thinking about the Minnesota State High School League’s transgender athlete policy that’s been on State Representative Steve Drazkowski’s Facebook page–check out our post Draz’s campaign treasurer compares being transgender to being serial killer Ted Bundy. On Saturday, the Mazeppa lawmaker shared an excerpt from the press released by the MN Family Council following approval of the policy; Draz found it via the campaign Facebook page of House District 35A Representative-elect Abigail Whelan. On Sunday, the Draz and Sheila Kihne, who unsuccessfully primaried sitting Eden Prairie Republican Jennifer Loon engaged in a curious Facebook conversation about tension between the Minnesota Family Council and Speaker-elect Kurt Daudt. Amazing– and Kurt Daudt– the new Speaker was telling people not to complete the MN Family Council candidate questionnaire because he doesn’t like the organization. They have been standing up against this nonsense and I’m grateful for their efforts. When I left the meeting last week, the Outfront MN organizer was telling her group: “I know some of you are upset, and that more is needed” This is just the beginning. The bullying bill that passed last year as well as the redefinition of marriage means that our public schools will be confusing kids as early as kindergarten. And private schools will be forced to comply or turn over their measly amount of funding for things like textbooks and nursing services. It’s time for school choice. Alas the GOP House leadership will likely be working with the Democrats on expansion of PreK instead…. MN is in distress. I think the implementation of this radical liberal social agenda will serve to actually undermine the K-12 education monopoly and prompt even more parents to send their kids to private schools or home school them. Yes, Sheila Corbett Kihne, educational choice must be our focus, and we must fight the efforts to expand the nanny state. They want to back the school bus right up to the hospital….nonsense! Never mind that the Republicans eliminated the Early Childhood Education Committee. On the other hand, by putting Loon in charge of the K12 Education Finance Committee and dissolving the ECE Committee, perhaps they destroyed the committee in order to save early childhood education from deformers like The Draz and his ally Kihne. Kihne’s remarks might serve as guide to understanding why some Republican House candidates–like the Draz-recruited Tim Miller–answered the Minnesota Family Council’s questionnaire, and others–like Loon recruited assistant minority leader elect, representative-elect David Baker (Wilmar)–did not. (Incumbents of both parties were scored according to actual votes. Will the Family Council’s Voter Guide prove to be a clue for understanding the divisions between social conservatives and Main Street Republicans in Kurt Daudt’s House of Cards? Stay tuned. Photo: The winter of Steve Drazkowski’s discontent, aka, ordinary time.